Who doesn’t love a good full face palette? It’s great for travel, easy to toss in your bag for a long day of work or school, and generally just cuts down on the number of decisions you have to make on a busy morning. No choosing which blush or bronzer or eyeliner—it’s all there for you, helping your morning run just a little more smoothly. It’s like the coffee of makeup. 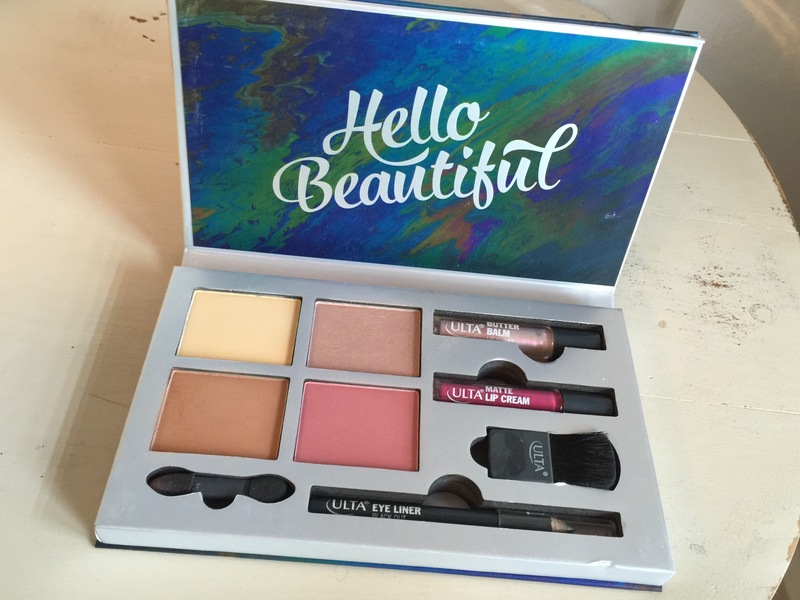 This is Ulta’s Hello Beautiful Deluxe palette: a full-face palette for Summer 2016. I got it last May as a free giveaway with an Ulta purchase. (I bought their eyebrow tint and lip primer to get it, in case you’re wondering. I plan to do a brand review of Ulta products soon and talk about those there. They’re both amazing.) This palette contains 28 eyeshadows on one side, then on the other, it has a banana setting powder, a highlight, a blush, and a bronzer, as well as a lip gloss, a matte lip cream, an eyeliner, a blush brush, and a sponge-tip applicator. The brush and applicator are pretty much useless; I only keep them because for some reason it would annoy me to have empty slots in the palette. Everything else, though, is fantastic. I’ll go through each group of products separately. First, though, can we admire the packaging? Sigh. This might be one of the most beautiful palettes I have. Yes, it is cardboard, so it’s not as luxurious as some others, but I could seriously stare at the watercolor effect all day. It’s just stunning. I love the eyeshadows in this palette. The overall feel of the palette reminds me a lot of the It Cosmetics Naturally Pretty Romantics palette. 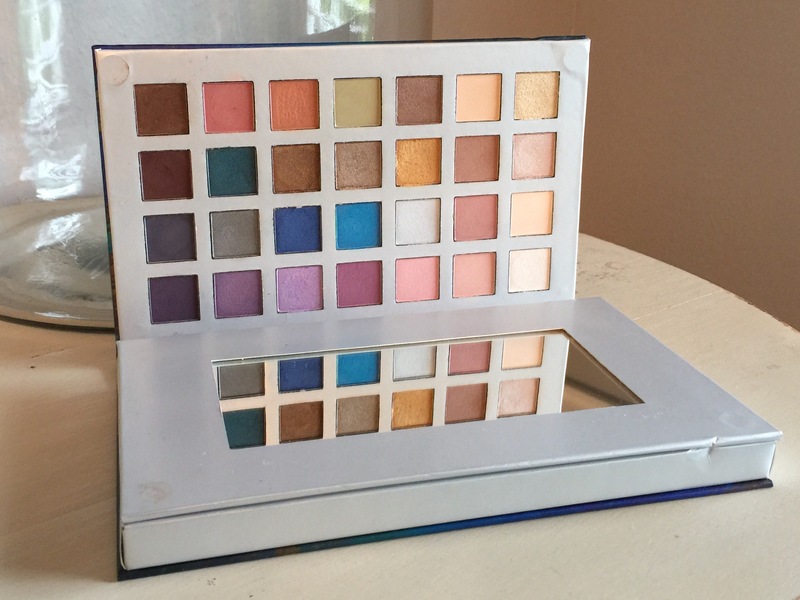 It’s not a dupe for that palette, but it could create similar looks. 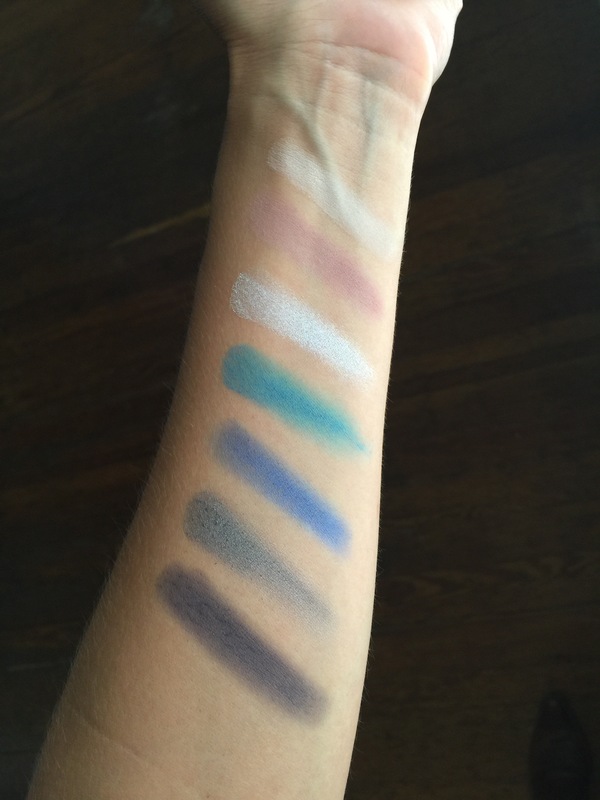 It’s full of cool-toned pastels, some mattes, and plenty of shimmer and metallic shades. 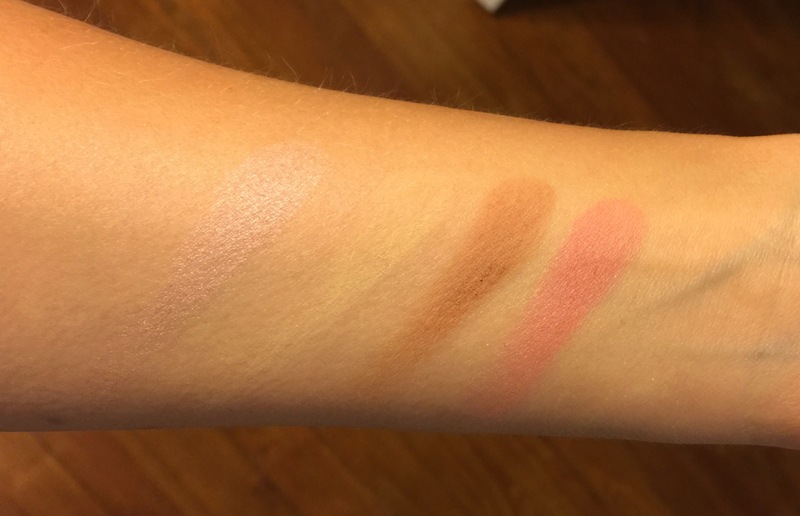 The It Cosmetics palette, for comparison, is all mattes. I’m pretty impressed with the color payoff and staying power of all of the shadows (I do always use a primer), and I can create so many different looks with them. Yesterday I did all mauve and lilac, and today, a brown and navy smoky eye. They also layer well, so transitioning from day to night is a snap. 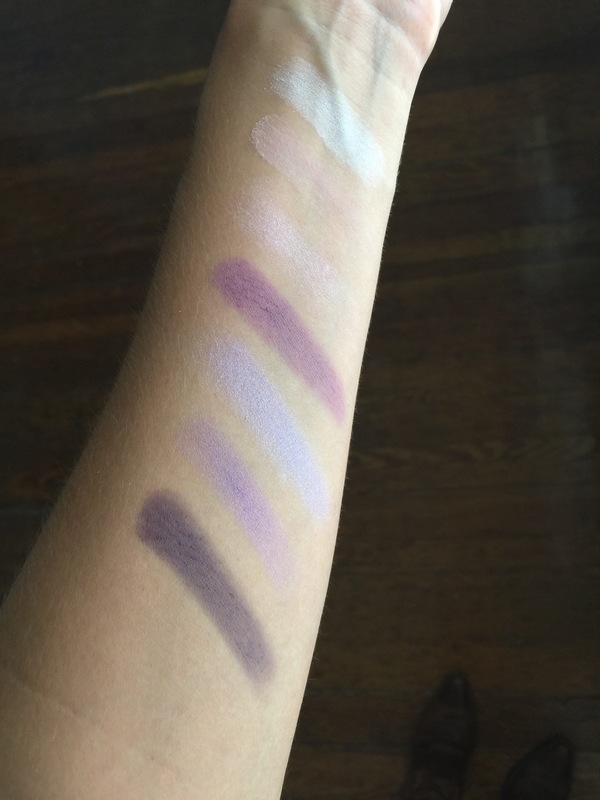 Here are the swatches of each eyeshadow (used my finger, no primer, no flash). 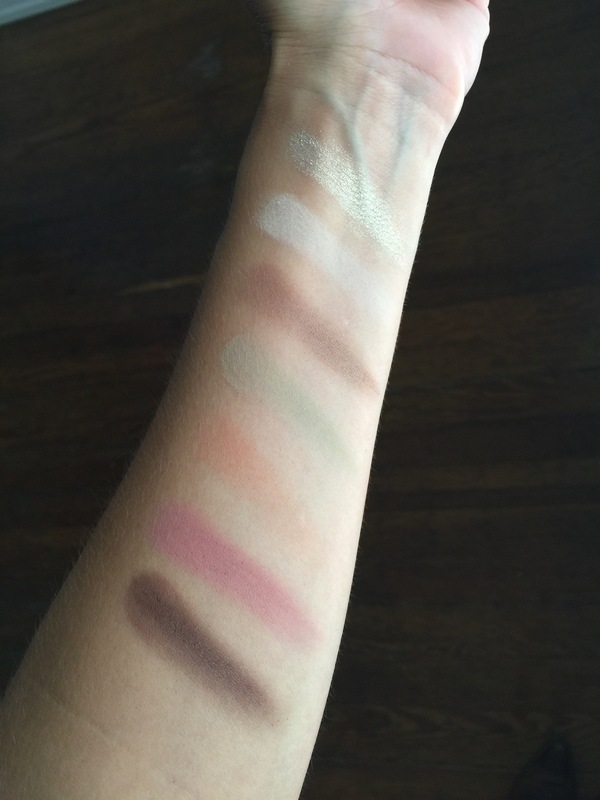 The images start in the bottom right corner of the palette (nearest the mirror) and the swatches go right to left. Not sure why I did them that way, but I did. There is really only one true dud among them, but of course it was the one I was immediately drawn to: the burnt orange shade in the top row, third from the left. I did everything to make it work: I used different brushes, my finger, I even dug the top layer off with my fingernail in case there was an overspray that was keeping it from working. Nothing. It is the stiffest eyeshadow I’ve ever used. But one dud out of 28 isn’t bad. And since I love this shade, it’s not like I don’t have it elsewhere in my collection. The rest, however, are really good. They are generally really creamy shadows—not the most pigmented shadows I’ve worked with, but that’s not necessarily a bad thing. Since I tend to do my makeup downstairs in not-so-great lighting while my son watches cartoons in the morning, I typically prefer shadows that I’m not too worried about. They’re not dry or chalky, and they blend out very well. I really, really love that blush. As for the rest of the products, the eyeliner in Black Out is great, but be warned: It is not black. It is charcoal. Personally I prefer that, as it is a softer color for day, but if you want a black liner this one isn’t for you. The lip products are both good. The Butter Balm in Belle is an iridescent gloss, great for applying to the center of the lips to make them look plumper. The Matte Lip Cream in Striking is similar to the NYX Matte Lip Creams in that it dries down a bit, but does not become entirely matte and is not transfer-resistant like a liquid lipstick. It is a gorgeous deep bright berry shade, great for the transition from summer into fall. As you can probably tell, I love this palette. It is great for travel, as I can attest from personal experience. I had to attend a conference a few days after receiving this palette, so I brought it with me, along with a foundation, concealer, mascara, and one lip color (Revlon Ultra HD Lipstick in Tulip—my favorite, if-I-could-only-use-one-lip-color-for-the-rest-of-my-life, perfect mixture of red, pink, and coral shade). It was the lightest makeup bag I’ve ever packed. This palette was perfect: it had enough light, medium, and dark neutrals to create a very basic, professional look for day. When I went out to dinner in the evenings, I added pops of purple, blue, teal, or turquoise in the outer corners or as liner, and those colors performed beautifully. And as an added bonus, since it was free, I wasn’t constantly worrying about the airline losing it, as I would be if I’d taken my higher end palettes. Still, it is a staple in my collection. Final Word: I highly recommend this palette. It is currently on sale for $9.99 at Ulta (down from $19.99). 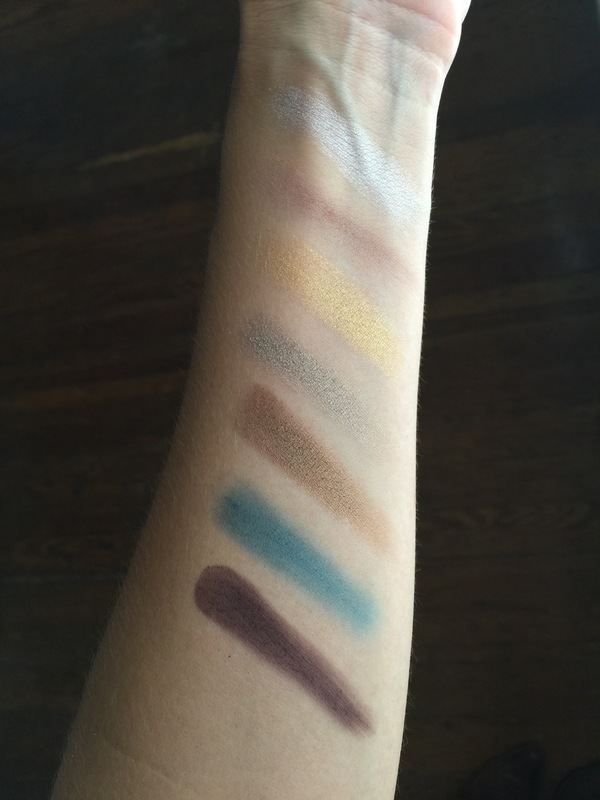 I would guess this is because it is their summer palette, so I assume (and hope) a fall one is in the works. 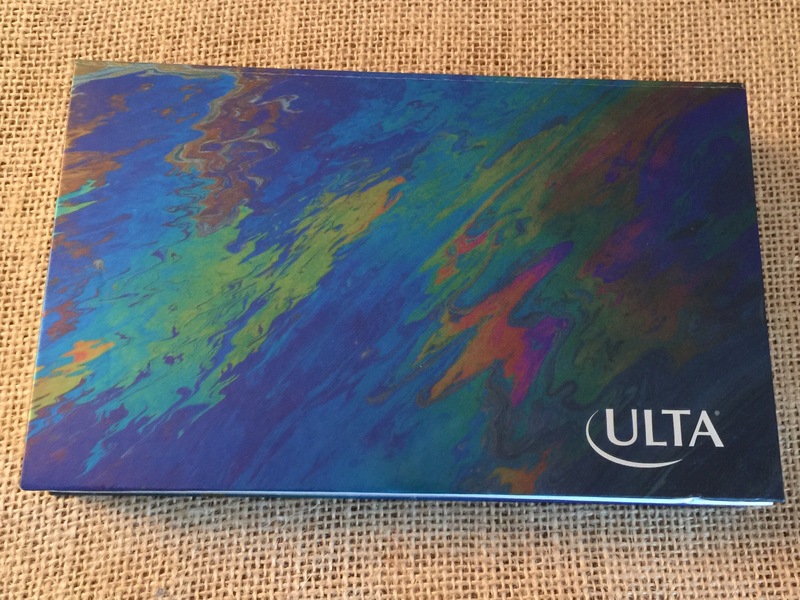 Ulta is doing a free gift (through 8/27/16) with a $21.50 Ulta cosmetics purchase, but if you don’t want to spend another 12 dollars, this palette is totally worth it even without the free gift. Every time I use it I fall more in love with it.